My Google AdSense / AdWords widgets aren't showing up on my dashboard. How can I fix this? We've found that Google AdSense / AdWords widget won't appear on your dashboards when you have browser extensions such as AdBlock, AdBlock Plus, etc. installed in your browser. These extensions (incorrectly) block Google AdSense / Ad widgets and also interfere with other dashboard functionalities such as moving the widgets around. 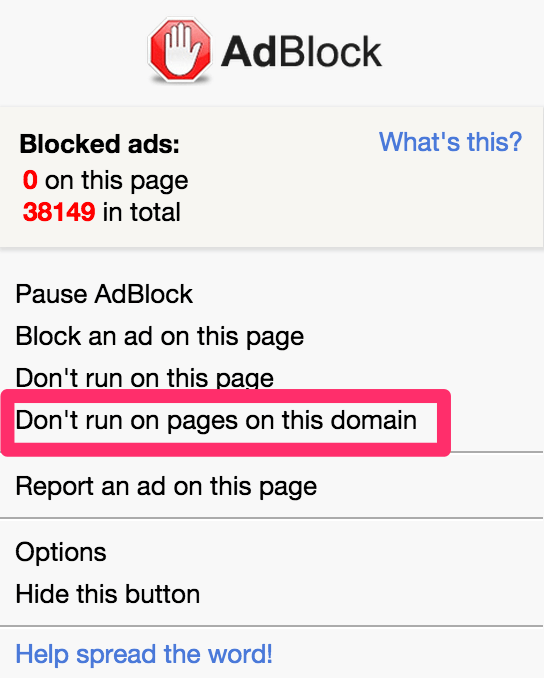 Open up the AdBlock extension in your browser and click Don't run on pages on this domain. Move the Site slider to the right so that AdBlock doesn't run on pages under *.geckoboard.com/*. And that's it! When the page reloads, your Google AdSense / AdWords widgets and dashboard functionality should start working correctly. You'll need to do this for each browser you have AdBlock installed in. If you continue to experience issues with your Google AdSense / AdWords widgets or dashboard functionality, please drop us a line. We'd be happy to help!